I’m not the person you should come to when looking for meal prep or meal planning inspiration. 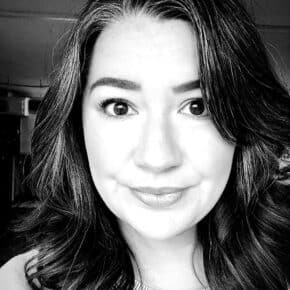 My life runs a little differently than most…. 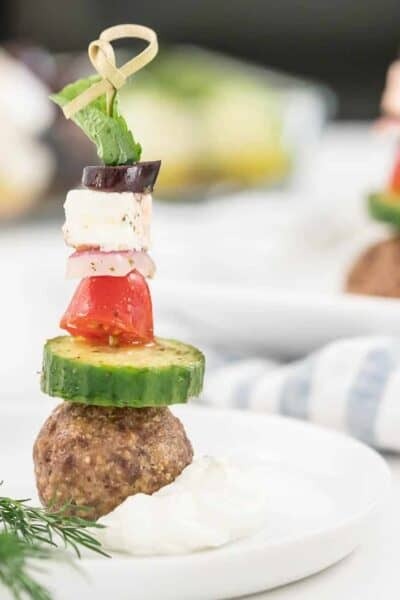 For us, our meals start with what’s in the fridge THEN we combine it with what’s growing in our garden or fresh ingredients from our local farmers market. 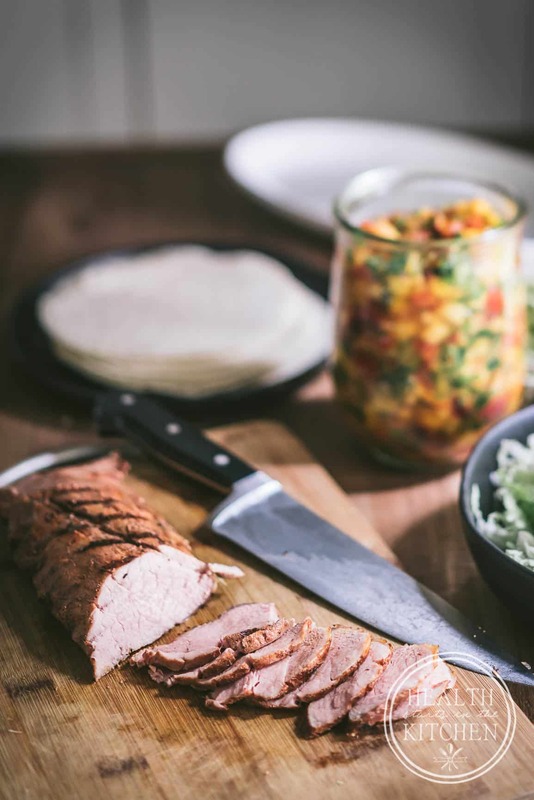 And that’s exactly how Grilled Pork Tenderloin Soft Tacos with Peach Jalapeno Salsa came to be. 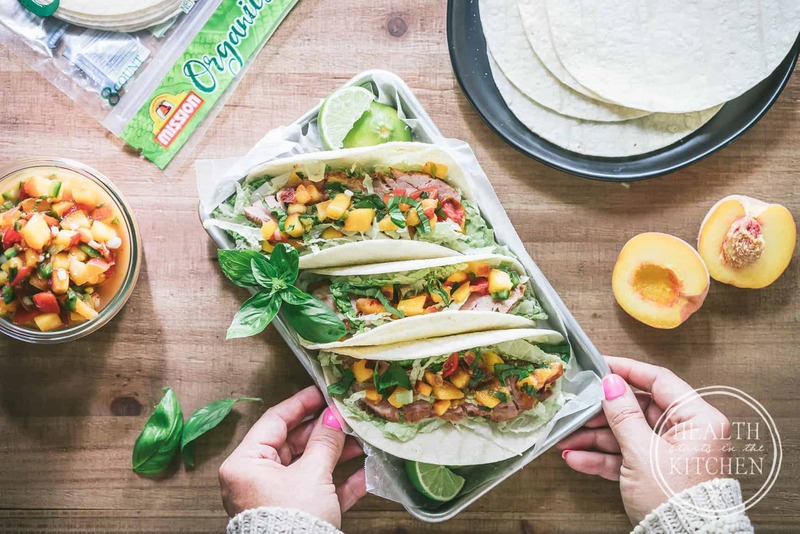 In this case, it all started with Mission Organics® White Corn Tortillas. 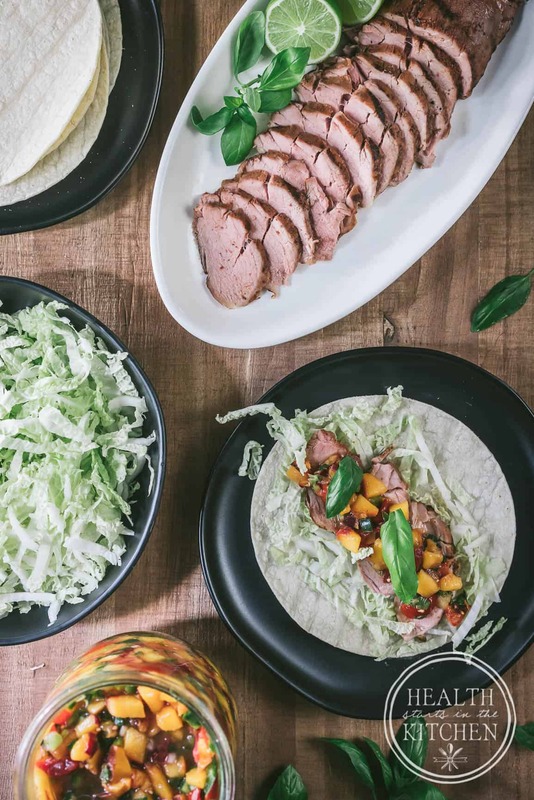 While you won’t often find bread, buns or bagels at our house… you will almost always find tortillas. Ray loves his bread, perhaps a little too much. Several years ago we agreed that keeping bread around wasn’t best. He’ll save indulging in sandwiches for when we go out to eat and are not at home. 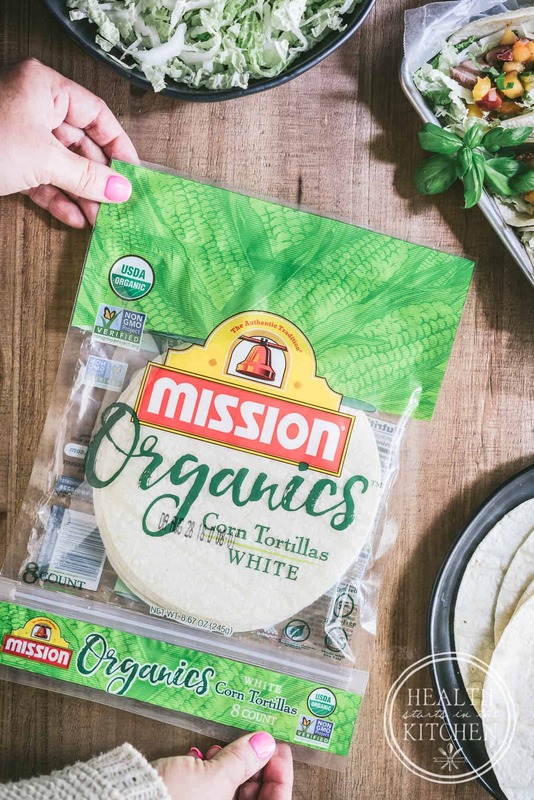 Mission Organics Tortillas are for people like us, who believe that the quality and flavor of their tortilla is just as important as what goes into them. USDA certified organic and non-GMO project verified, enough said, right?!? 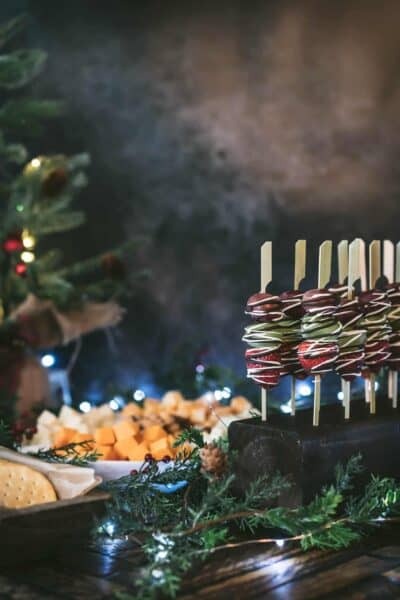 No artificial preservatives and no artificial colors or flavors added, real food is delicious enough on its own so there’s no need to add anything extra! 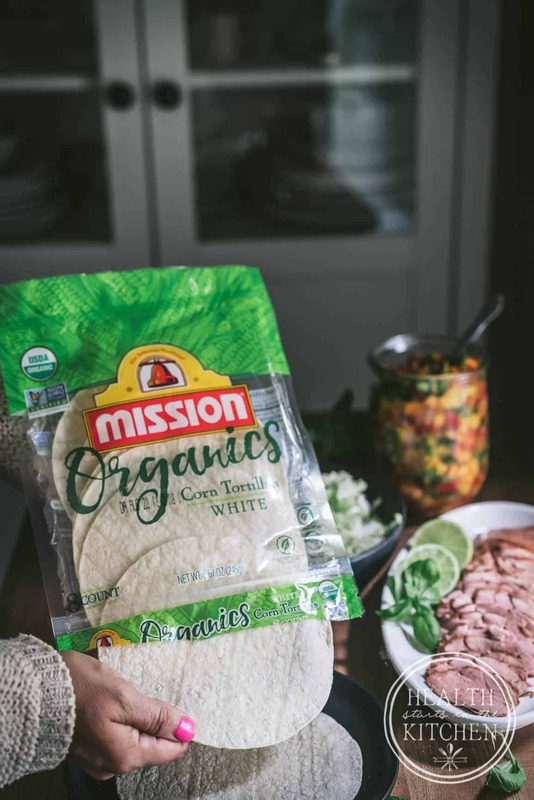 Made with real food, with an authentic heritage and just a few, wholesome ingredients, Mission Organics Tortillas are crafted with the same care and quality you put into tortillas you’d make at home. Certified gluten-free, while Ray isn’t 100% gluten free he definitely feels better when he eats less gluten. 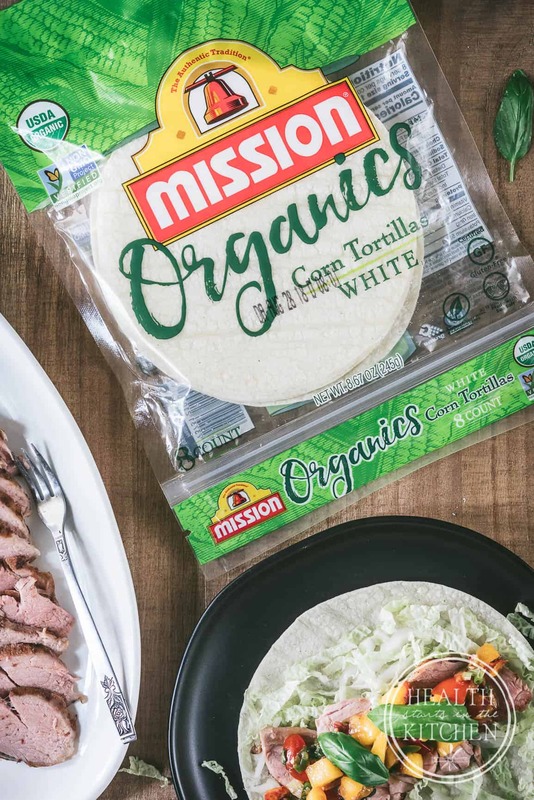 It’s so easy to find Mission Organics Tortillas nationwide at your local grocery store, even in our very rural southwestern Pennsylvania area, unlike comparable quality breads. Find a store near you by visiting Mission Organics. 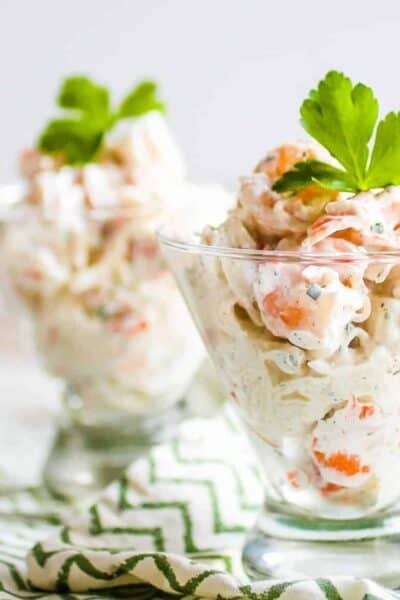 There are also great recipes too to help inspire you! 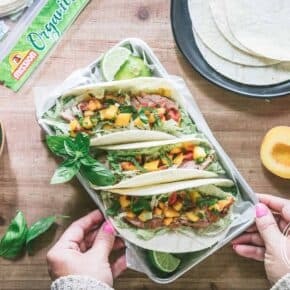 Mission Organics Tortillas stay fresh longer than bread, so I can stock up the fridge and always have them on hand without worry of them going bad. 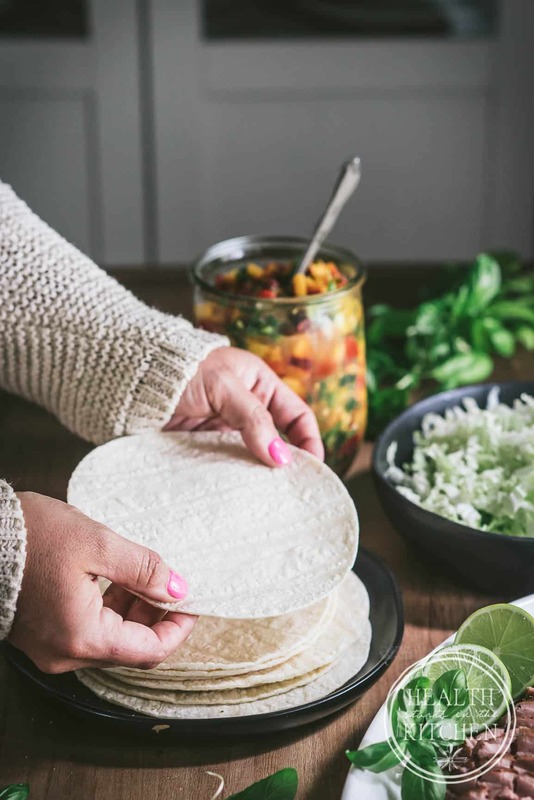 More versatile options, I feel so much more creative when it comes to filling tortillas, they adapt to a wide variety of fresh flavors and when in doubt even good with just cheese! I know it’s so easy to head to the store, having the same produce available year-round, BUT then you’re not eating the best of the season! 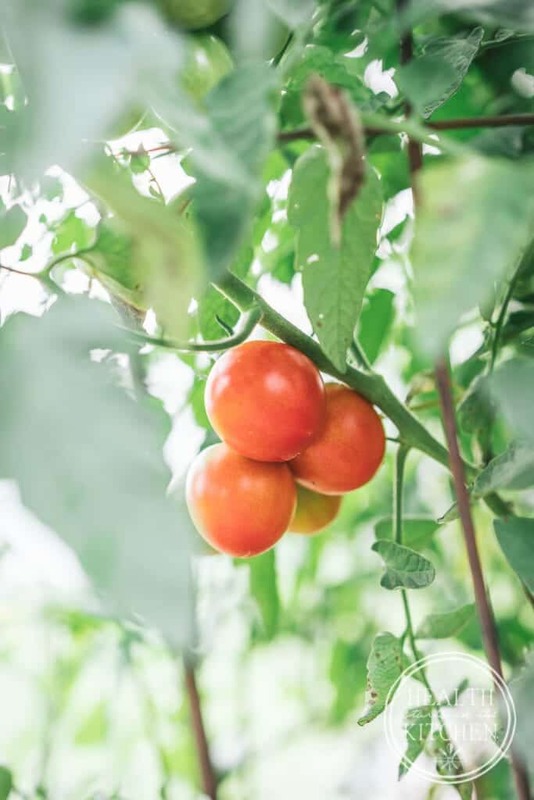 No store bought tomato will ever be as delicious as one picked fresh from your own garden or from a local farmer. 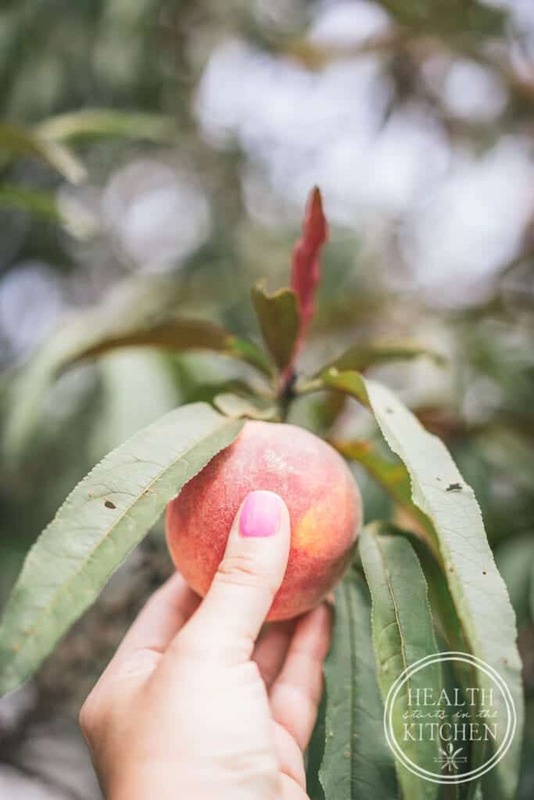 From all the years that we’ve had our own garden and have been active customers at our local Morgantown Farmer’s Market, many people think that the harvest ends in August, when in fact the BEST month for our local produce selection is always September, aka Organic Harvest Month! 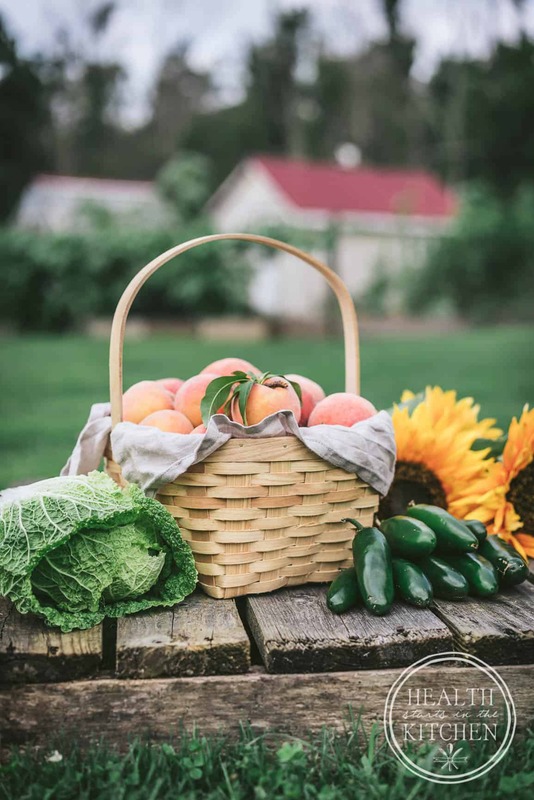 While summer-heat is coming to an end, that means that you can get the best of summer’s harvest, including many things that require a longer growing season like melons and winter squash. Plus farmers are picking their biggest yields, making buying in bulk for your winter prep more affordable! From our Garden: Fresh picked Tomatoes, Jalapeños, Basil and Juicy peaches. Garlic saved from the spring. 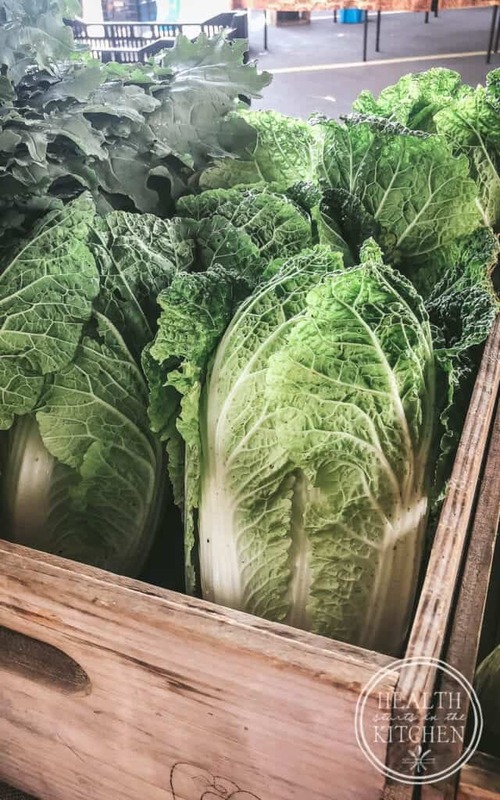 From the Farmer’s Market: Pork Tenderloin, Napa Cabbage & Green Onions. 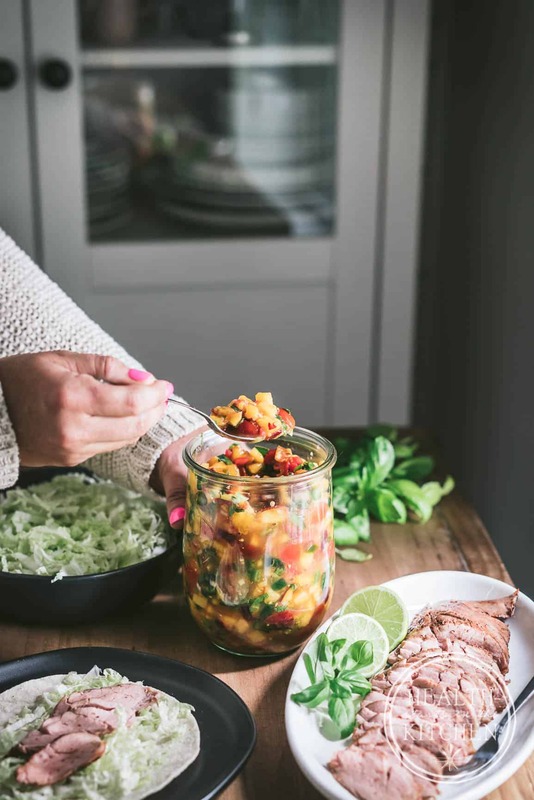 With such amazing FRESH foods, who isn’t inspired to create a delicious meal to fill those tortillas! I like to stack the tortillas on a plate and warm for best flavor, I just put them in the oven for a few minutes (while I’m prepping everything else). You can also grill them or gently heat in a skillet. 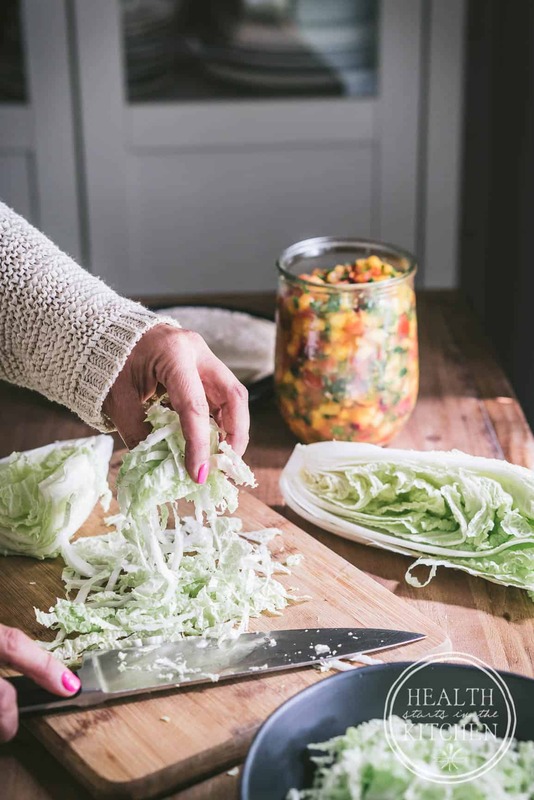 If you’re new to Napa cabbage, it’s lighter in flavor and texture than regular cabbage, kinda like a lettuce-cabbage hybrid. 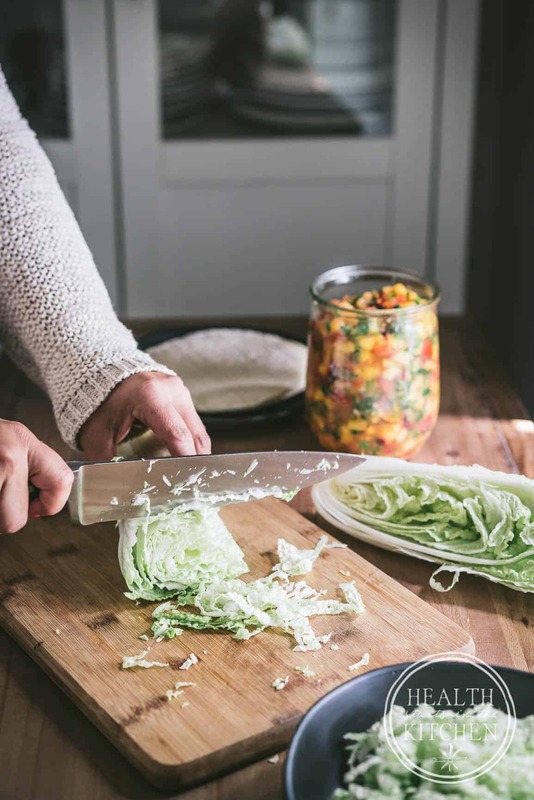 Thinly slice your Napa cabbage and place it in your tortilla first…. 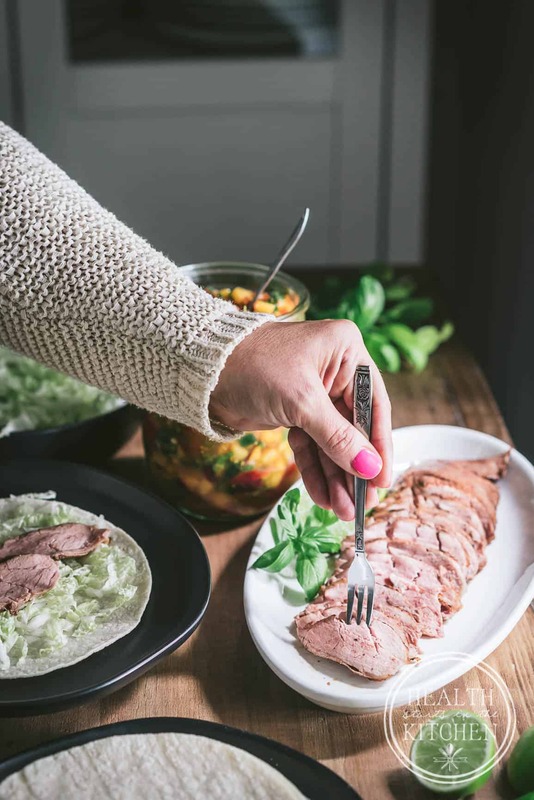 Add thinly sliced grilled pork tenderloin on top of your Napa cabbage… I know that for many home-cooks, getting the perfect cook on a pork tenderloin can be super intimidating. Nothing is worse than prioritizing pastured pork from your local farmer, only to overcook it into a dry mess. The key to keeping that pork tenderloin juicy is keeping a close eye on its internal temperature. I prefer cooking mine to 140°F (medium, slightly pink). That way I know that even leftovers won’t be over cooked. 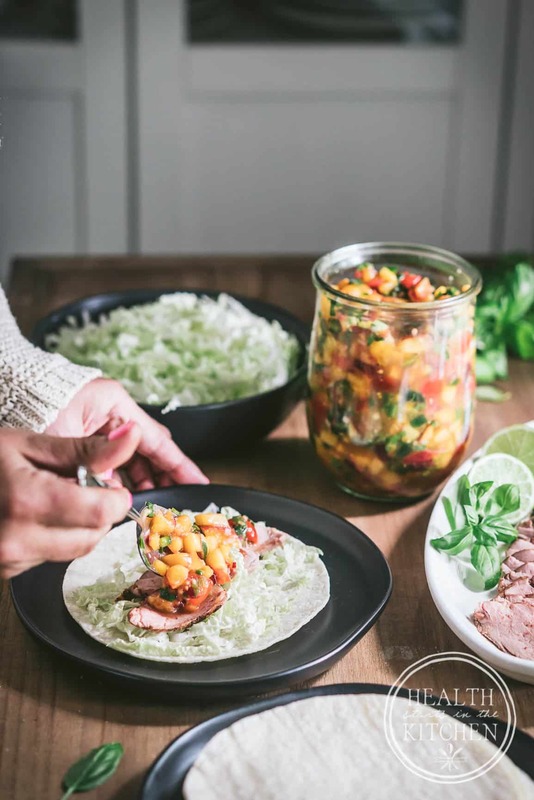 Top your taco off with homemade Peach Jalapeño Salsa! 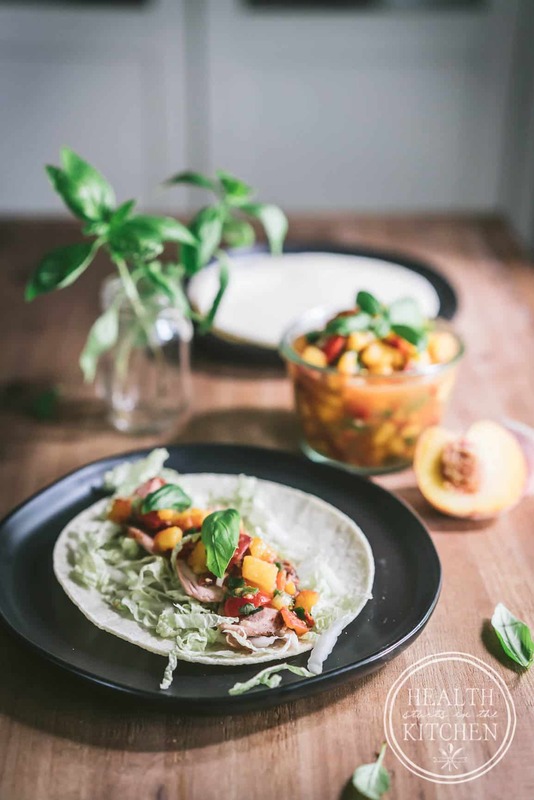 Peaches, jalapeños , onions, tomato, basil and a squeeze of fresh lime is all you need. 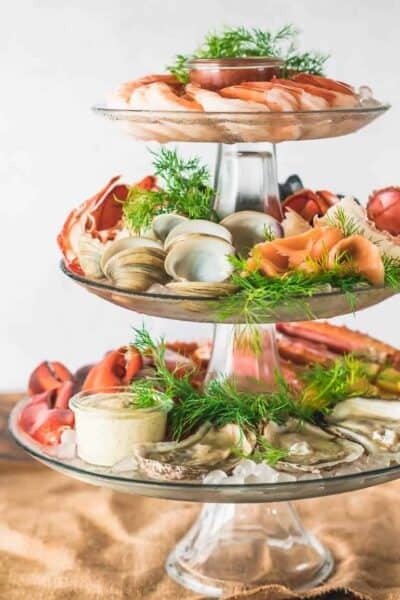 When you are working with fresh ingredients you don’t need complicated recipes. 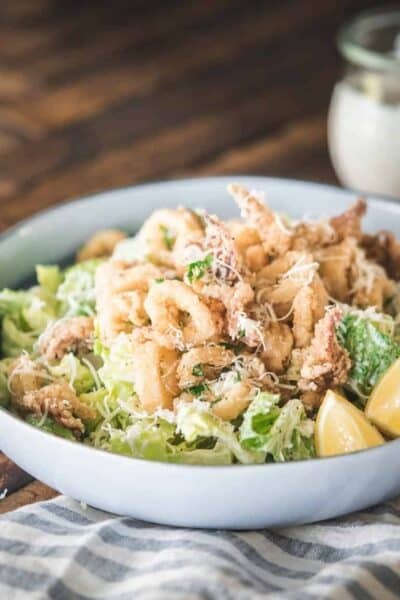 Truly the best meals don’t need a recipe at all! Is your mouth watering?? I know mine is! 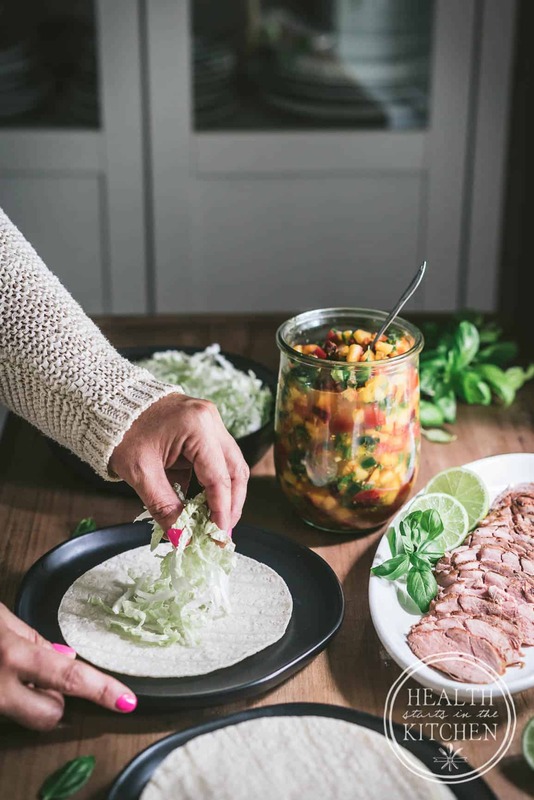 All the freshness of harvesting ingredients in my garden and purchasing at my farmer’s market wrapped up in a delicious Mission Organics White Corn Tortilla – it doesn’t get much better! While I stick to enjoying one soft taco at a time, Ray prefers multiples…normally multiples, multiple times to be honest. He loves tacos. He had no complaints about enjoying these 2 days in a row! 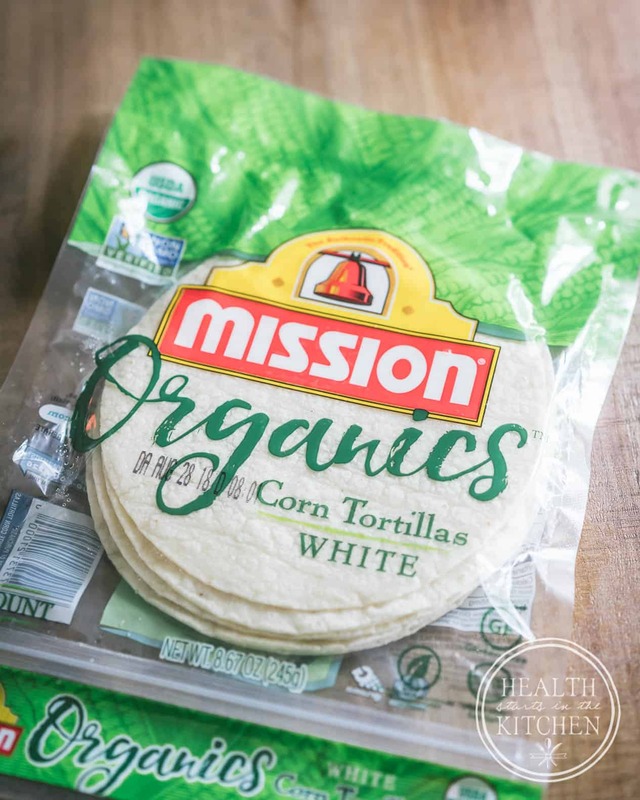 So before you head out to your garden or your local farmer’s market, make sure you’re stocked up on Mission Organics Corn Tortillas. 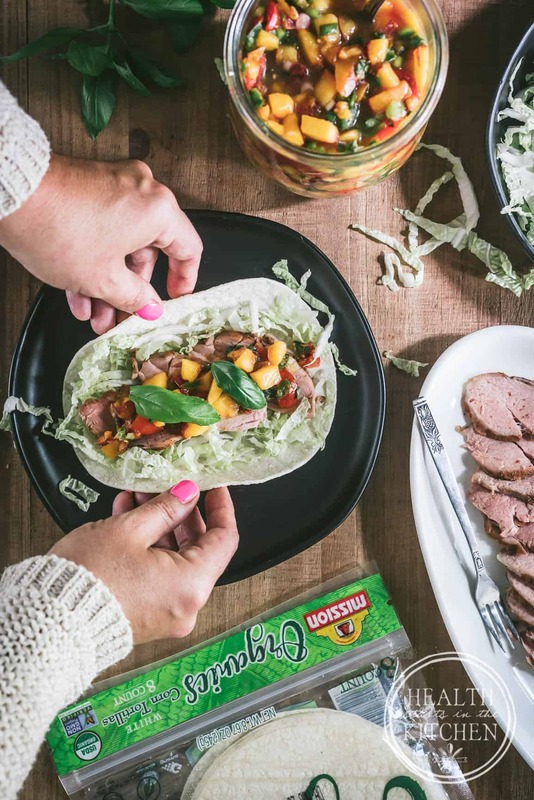 You’ll be surprised at how easy it is to put together Harvest Month meals with them! How would you fill them? For the Grilled Pork Tenderloin: Drizzle tenderloin with avocado oil and season with cajun seasoning. Can marinade in the refrigerator for up to 2 days before grilling.Over medium/high heat, grill until the tenderloin reaches 140°F for the prefect medium cook. Remove from the grill, place on a plate and cover with foil. Allow to rest for 5 minutes before slicing. 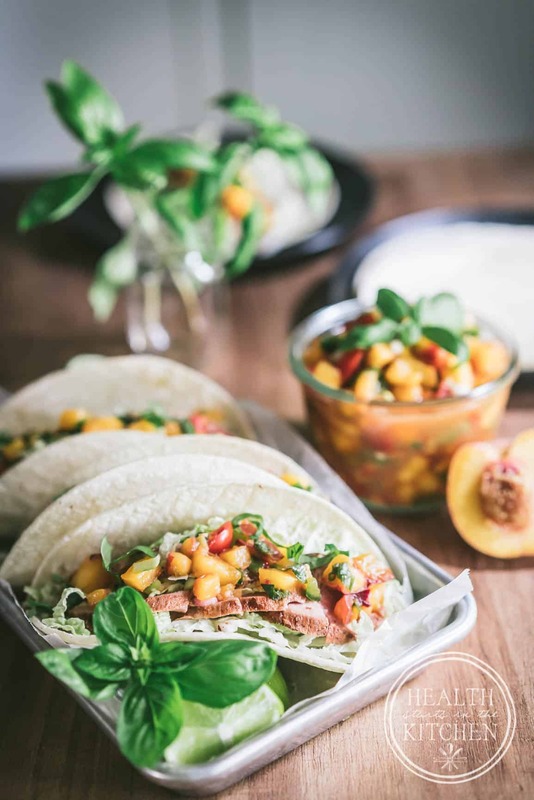 For the peach jalapeño salsa: finely chop peaches, tomatoes, jalapeno* green onion and basil. 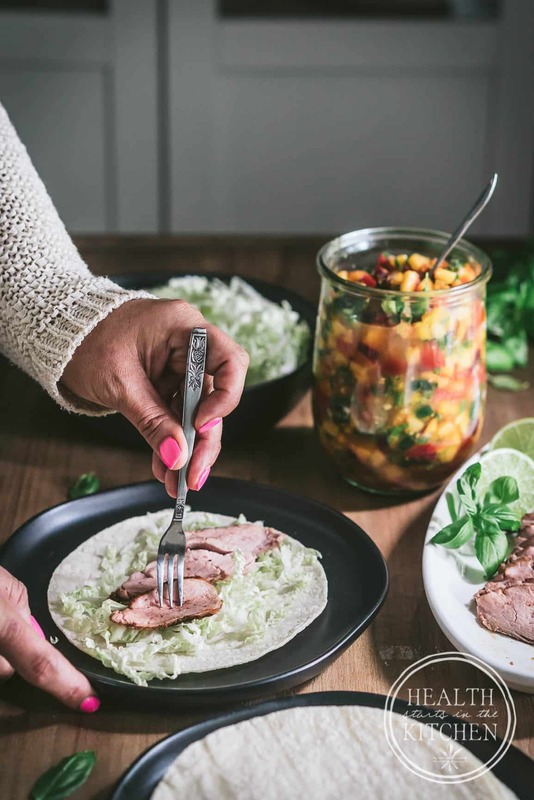 Combine with remaining ingredients, season to taste with sea salt..
Top each Tortilla with shredded Napa cabbage, thinly sliced pork and a generous spoonful of peach jalapeno salsa. Enjoy! 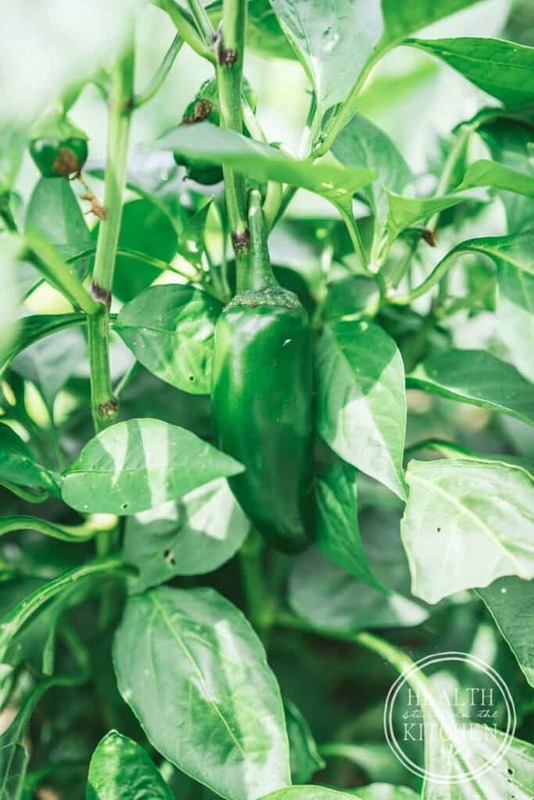 *1 jalapeño will yield a mild/medium spice level. Add more or less as desired. For no spice, use green bell pepper. For those of us that are grill-less would cooking the tenderloin in an oven or slow cooker work just as well? The recipe sounds amazing! I’d use a grill pan on the stove or a cast iron skillet. I thought I posted already, but I guess not! This was an AWESOME meal. I have a large family, so I did a 6lb loin in the oven, and temped it to 140. Fantastic salsa, and the nappa cabbage really added such nice texture and sweet flavor to the taco. Super glad I came across your site. I did your pickled hen of the woods, and I’m doing the lamb and butternut “stewp” tonight! Cheers.